Casio DW6900MF-1.The company Casio America, Inc has expanded the regular hour for new collection of watches G-SHOCK DW6900. 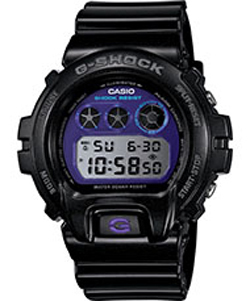 The company Casio America, Inc has expanded the regular hour for new collection of watches G-SHOCK DW6900. G-Shock DW6900 – Men’s functional and stylish watch. New series of watches DW6900MF available in three colors: DW6900MF-1 – in the coal-black with purple dial, DW6900MF -2 – monochromatic blue-gray body with a blue dial and DW6900MF-4 – red metallic. “Based on the strong popularity of G-Shock, we assessed the most popular series. This new series is a good solution, it gives collectors a new style, while using our main frame. “Like any watches Casio G-Shock – performance and durability are the basis of a series of DW6900MF. Features include – waterproof 200 meters, back light, stopwatch, countdown timer. Series DW6900MF will be available in September 2012.